Seven fossil teeth exposed by the Panama Canal expansion project are the first evidence of a monkey on the North American continent before the Isthmus of Panama connected it to South America 3.5 million years ago. A team including Carlos Jaramillo, staff scientist at the Smithsonian Tropical Research Institute (STRI), published this discovery online in the journal, Nature today. 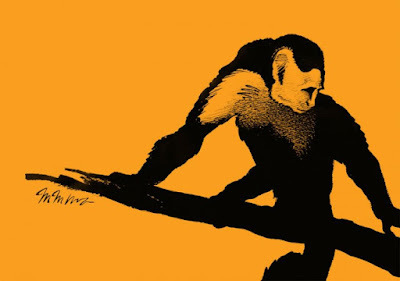 They named the new monkey species Panamacebus transitus in honor of Panama and the monkey’s movement across the ancient seaway that divided North and South America. The 21 million-year-old teeth were found in the Las Cascadas Formation during a five-year intensive fossil salvage project by field crews from STRI, the University of Florida and the New Mexico Museum of Natural History and Science. Most of the mammal groups represented in the Las Cascadas formation have North American origins, despite the fact that South America is much closer, supporting the idea that Central America and western Panama represented a long peninsula extending south from North America. During the salvage project, researchers rushed in behind engineers as they dynamited the steep canal banks. The researchers collected exposed fossils and described each location before heavy rains and fast-growing vegetation obscured evidence of the dramatic tectonic events that lifted the land bridge out of the sea to connect North and South America. Before the monkey teeth were discovered, the oldest evidence of movement of a mammal from South to North America are 8.5–9 million-year-old fossil remains of giant sloths. The authors of this report suggest two explanations: 1) that mammals from South America were more adapted to life in the South American derived forests still found in Panama and Costa Rica than to other forest types characteristic of Northern Central America or 2) that the lack of exposed fossil deposits throughout Central America means that evidence of these dispersals has yet to be revealed.